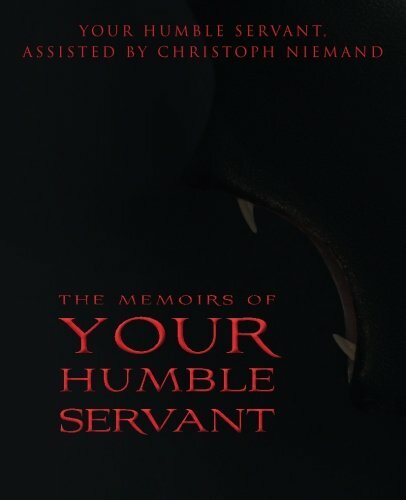 The Memoirs of Your Humble Servant is the horrific tale of one of the eldest of the species called the Shaj'kal. The Shaj'kal feed on human blood, they have always been among us, and they are immortal. Your Humble Servant, at the time of publication of this memoir, is just over 4000 years old and has therefore seen that majority of human history pass before him. This has allowed him to gain insights into our existence that very few of us will ever have the chance to truly and deeply explore. Throughout the book he exposes the reader to certain universal truths that seem to guide human behavior: Truths of which few of us are aware. In each chapter he also relates to the reader various hunts of and feeding upon humans. Rightfully, he holds almost all of humanity in a very high degree of contempt, as he has watched us hoard and kill in never-ending cycles. To paraphrase his statement in one chapter; "The next time you eat a hamburger, explore your feelings for the animal that provided the meat. Once you do this, you will begin to understand my feelings toward you. You are food to me and nothing more." His life, and indeed, the lives of all of the Shaj'kal are at the same time completely merciless, and yet not without a strange breed of virtue and higher form of morality. Regardless of his self-proclaimed moral virtue, the tale of his life is a non-stop adventure in an unknown and unseen world of darkness and death. It is cold death without feeling or remorse. It is killing a squirrel, gutting it, cleaning it, and cooking it over a camp-fire. We are the squirrel. It is a wonderfully horrific read that will at the same time frighten you and make you ponder your own existence. Questions regarding biographical information for Your Humble Servant can be addressed to Mr. Christoph Niemand at christoph.niemand@hotmail.com. All queries will be answered as quickly as possible.